Yes, I’m paying $9 a bag for organic hamster food – double the normal cost, and $9 was the sale price. Yes, I’m ordering it online because I can’t find it locally. And, yes, I’m laughing at the whole situation because sometimes that’s all you can do. Few things are simple in the world of food allergies, including, it seems, feeding a pet. 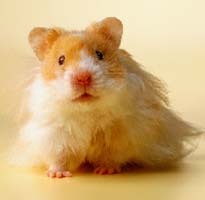 Luckily, a hamster-knowledgeable, Net-savvy friend has come to the rescue so the pet won’t starve. The day after Eloise Laptop Cheez-It moved in, Big Guy noticed something in her food dish. “Mom, is that a peanut?” he asked. Arrrrrrrrrrgggggggggghhhhhhhhhhhh! I moaned after commending him for recognizing a peanut. My brain screamed as I ran for the bag of food the neighbors had included in her relocation package. Sure enough, there it was listed right on the bag of Vitakraft: Peanut. Now, at age 6, Big Guy is plenty old enough to know not to stick his face in a pet dish and chow down. He’s been taught to not eat seeds unless I check them first because most are processed on the same equipment as peanut. But, still, he’s contact allergic – if you touch peanut then touch something and he later touches the same thing, he’ll have a reaction – and I didn’t want him to have to avoid contact with what already was a beloved pet. For the time being, though, I scurried Big Guy away from the cage and then did what any panicked mom would do in such a situation. I sent out a tweet. A friend quickly responded on Facebook with a Web link listing what hamsters can eat. He also suggested bird seed, which probably wouldn’t work because much of it either has peanut or carries a contamination warning, or maybe seeing if a feed store could concoct a custom blend. I’d planned to go the feed store route as soon as we could get to one – the only chicken feed on post is Dad’s paycheck – when my friend came up with another option. Look at 8 in 1 Ecotrition Organic Hamster & Gerbil Feed, he said. There’s no peanut listed in the ingredients. I looked. No peanut, and no contamination warning either. I’m not sure I believe the lack of a warning since so many other Ecotrition products contain peanuts, but I feel comfortable with the small possibility of contamination as long as Big Guy agrees to not French kiss the hamster. I doubt I’d buy it if Big Guy had ever reacted to peanut dust, though. So I’m laughing, because it worked out OK in the end. Expensive, but OK. Even Dad, who’d vowed just days ago that he’d never have a rat living in his house, is laughing. He probably won’t be when he sees the next credit card statement, though. see? you are raising an observant kid and, now, a peanut free fur baby. I just happened to look up hamsters on wiki earlier this week because I wanted to know their origins and how a rodent became a pet (daughter is really into the movie Bolt right now). Apparently in the wild they eat normal foods…look at wiki for more exact stuff. So if you wanted to fore go actually buying stuff, consider feeding it table food. Melissa, that’s pretty much what we’re doing right now while I wait for the peanut-free stuff to come in. I kind of like this way, because it teaches the guys to make good decisions about what Eloise Laptop Cheez-It should eat. Maybe one day they’ll translate it to themselves. It also makes them more responsible for her care. But I know there’s going to come a time when we just don’t have the time to prepare hamster meals – it’ll be that One More Thing that drives me nuts! – so we’ll use the ready-made food as a backup. It’s kind of like when the guys were babies and I kept a stash of jarred food around for those mad sprints out the door. Leslie, I was stunned that Big Guy picked up on the peanut. It was the tiniest bit of one, but he caught it. I am SO thrilled that he not only knows the words for what he has to avoid, but he’s clued in on the visual as well.